Hot water of beautiful rural district viewing Mt. Gassan, Hayama, Asahidake from a distance. It is hot spring which is most suitable for both families and group with abundant quantity of water. We were, and footbathing was possible as base of pleasant hot-spring resort. It is also having fun that walks hot-spring resort where steam goes up with yukata. 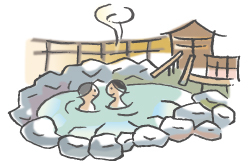 There are public bathhouse (five places) and footbathing of local visitor purveyor if we walk hot-spring resort aimlessly, and way of enjoying varies, too. When bitter yellowish brown hot water warms from core of body, and is hard to feel a chill after a bath; reputation. Footbathing largest in the prefecture is very popular, too.